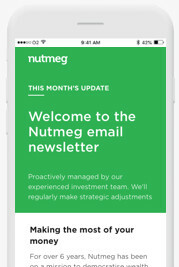 Nutmeg’s Personal Financial Advice service can help you make more informed financial decisions. It’s not always easy to know how best to achieve our ambitions. What's the right product for what I want to do? What about risk? Have a call at a time that works for you. Complete our online questionnaire about your finances and goals. This will clearly set out what steps we think you should take and why, so you can make the most of your financial situation. We'll take you through your report and help you implement our recommendations. The report will help you understand your financial circumstances, and provide information to help you meet your goals. We'll provide a review of your current financial circumstances, including analysis of any existing investments and pensions, and help you to identify your goals. We’ll then provide recommendations on what action you should take to ensure your investments and pensions are structured in the most tax-efficient way and reflect your risk profile and goals. The initial call is free. If you decide to go on to take financial advice, the charge is £350 Inc. vat. How long does the call take? The initial call will take around 15 minutes. The call to discuss your report will take around 45 minutes or longer, depending on the advice, and your questions. The scope of Nutmeg’s service and the products we offer are set out in the disclosure document below.